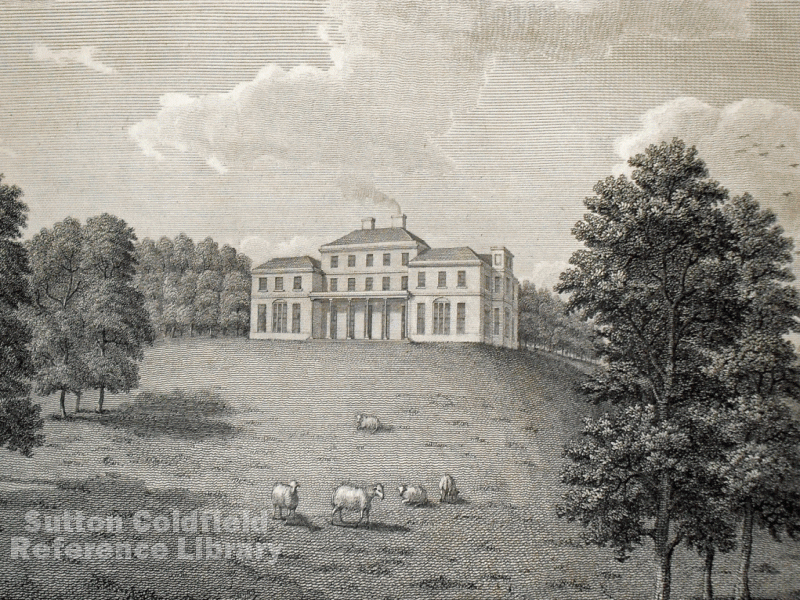 Miss Bracken’s History of the Forest and Chase of Sutton Coldfield was published in 1860, when old place-names forgotten today were still in use, and Miss Bracken speculated as to their origin. Near Tower Road in Hill Village was a field called “The Gaubage”, which was taken to derive from “gabelage, toll or glebe land for the monastery at Canwell”. Hill Village and Little Sutton feature in Sir William Dugdale’s Antiquities of Warwickshire, 1656, “these two petty hamlets I now joyn together, because I find that a good part of them antiently belong’d to the Little Priorie of Canwell”. Canwell Hall (demolished in 1957), which stood about a kilometre north of Bassetts Pole, was the home in 1824 of Sir Robert Lawley, and was on the site of the old priory. Sir Robert owned about 72 acres of land in the Little Sutton area, some of which may once have belonged to the Prior of Canwell, but Dugdale’s comment suggests a much stronger relationship with Canwell in earlier times - the men of Hill and Little Sutton were the Prior’s feudal bondsmen. Canwell Priory was founded in about 1140 and Pope Eugenius III confirmed it in 1148. A powerful Norman noblewoman, Geva of Drayton Bassett, issued the foundation charter, which specifies that the Priory is for the souls of herself, her ancestors, and her kinsmen, that the Charter is issued with the approval of her kinsmen and that it is made by the authority of her powerful relatives Bishop Roger of Chester and Ranulf, Earl of Chester. The Charter lists the property granted to the Priory, none of it in Sutton. Norman barons took care of their spiritual well-being by making gifts to monasteries, and Roger of Newburgh, Earl of Warwick, granted three virgates of land in Hill, in his Manor of Sutton Coldfield to Canwell in about 1150. The grant of Little Sutton property followed shortly after, and the De Berefords of Langley Hall also gave some Sutton land. In the thirteenth century the inhabitants of Hill and Little Sutton still owed fealty to the Lord of the Manor of Sutton (the Earl of Warwick), but they were bound to the Prior of Canwell for the duties they had to perform in return for their holdings of farmland in the open fields. By the fifteenth century the feudal system was in decline, the farmers were no longer serfs, and they paid their rent to the Prior in cash rather than in services. The foundation grants and later gifts were only sufficient to support a very small establishment at Canwell; most years after 1450 there was only one monk in residence, sometimes none. It was one of the earliest monasteries to be dissolved in the reign of Henry VIII, scheduled for dissolution in 1524 in pursuance of Cardinal Wolsey's project for founding Cardinal College, Oxford. After the fall of Wolsey the Priory’s possessions reverted to the king, and the process of dissolution was completed in 1530 when Thomas Cromwell and William Burbank spent three days at Canwell. By 1860 the name, Gaubage, was the only reminder of the power once exerted by the monks in this part of Sutton. 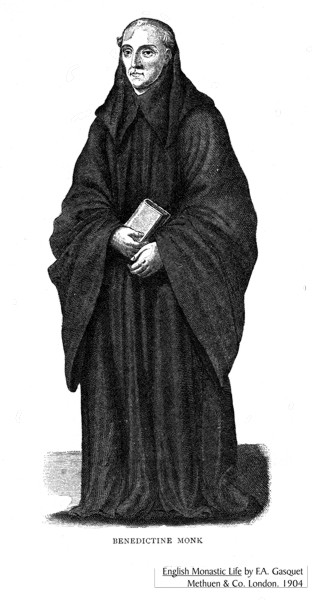 A Benedictine Monk - the Benedictine monks of Canwell once held sway over part of Sutton. Canwell Hall in 1800, seat of Sir Robert Lawley, Bart.